On Sunday I went to Cardiff Comic Con. It is certainly a much smaller affair than its big brother in San Diego but for Cardiff I only have to pay for the train! I went to the event last year only this time I actually plucked up the courage to get a couple of autographs! I know its silly to be nervous of such things, they are just people after all, but I could be nervous for Wales. When speaking to the special guests you only get a couple of seconds. Amongst others there was: Caitlin Blackwood, Eve Myles, John Rhys Davis, Bernard Cribbins, David Gooderson, Christopher Judge, and, Hannah Spearrit. 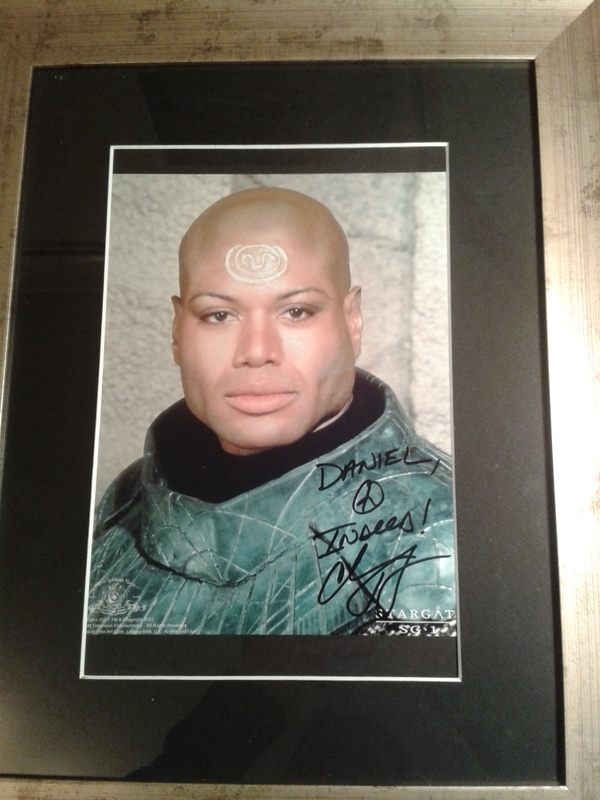 It was good to meet Christopher Judge and shake his hand. The picture says ‘Daniel, indeed!’ I only hope that when I go next year I actually manage to form words. Sunday was definitely the day to go. It was so quite when I arrived, compared with the queues the previous year, I thought that maybe it had been cancelled. Going on Sunday also meant I got to meet Hannah Spearritt; or Spearmint as my spell checker wants to say, which is not totally inappropriate as she is very sweet. You might know her from Primeval but I know her from S Club 7. I remember their TV series and still own, and listen to, their music. I know it is considered naff by many, and okay it is a bit, but I make no apology in saying that I like their music. S Club 7 and B*Witched were the fist two ban ds I really liked. I remember that B*Witched’s first album was available on cassette tape! (I’m old!) In the case of S club I remember being so eager to get their album I was asking about it about a week before its release. It was great meeting Hannah. She was very sweet and delightful. I know that is probably a tautology and I don’t care! On the picture it says ‘All my love.’- Yes I was a little smitten. As you can see I bought frames for my pictures. They will now take pride of place on my wall – as soon as I have a wall that is. S Club 7 – Reach 2000.